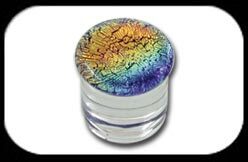 Glass Flesh Plug with Rainbow Dichroic colour. made from Pyrex Glass. Sizes 3 - 12mm. These plugs are double flared with a larger flare at the front, smaller flare at the back.